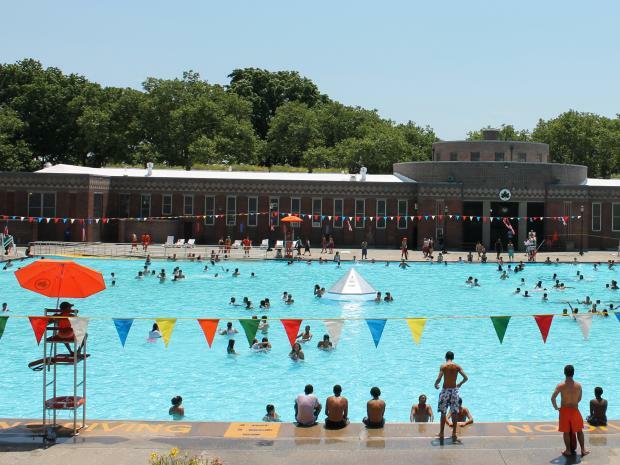 NEW YORK CITY — The city's public pools open right after the school year ends. Whether you’re an avid lap swimmer or just want to chill and tan, there are plenty of options. Most pools are open from 11 a.m. through 7 p.m., with a break for pool cleaning between 3:00 p.m. and 4:00 p.m.
We created a round-up of some of the best public outdoor pools to enjoy this summer — but, first, here are a few important things to know before you head for a swim. ►Most public pools require you to have a padlock for the locker room. Some won’t let you in if you don’t show that you have one. ►Swimming suit: You might be asked to show you have a swimsuit before entering the facility and men's shorts can be checked for a lining. Toddlers need to wear swim diapers. ►Only plain white shirts and hats are allowed on the deck as colored shirts may leak dye into the pool. ►You must bring a towel to access most swimming pools. ►Electronic devices, newspapers and glass bottles are not allowed on most pool decks and have to be left in the locker or at home. ►The lap swim program begins on July 5 and, while it’s free, you have to register online on the Park Department website. Registrations opened on June 12. Lap times are usually from 7 to 8:30 a.m. (Early Bird session) and from 7 to 8:30 p.m. (Night Owl session). They're reserved for adults. Not all pools offer lap swim and some pools offer only one of the two sessions. Regulars describe it as a “gem” in the neighborhood. The park features two pools, one regular and one diving — pretty rare for Manhattan. “It’s lovely and the pools overlook the East River,” said Hannah Borgeson, a New Yorker who started a blog in 2012 with the aim of trying out 40 pools before her 40th birthday. John Jay Pool is also a great place to tan as a few lounge chairs are available. However, wait lines can be long, especially on weekends, according to Yelp reviews. This Olympic pool is one of the quietest in the city, especially in the early morning during the lap-swim session, according to Borgeson. The site also features a wading pool for younger kids, which opens during the day. Early bird swimmers have to ring the buzzer at the entrance to get in. This is another Olympic-size pool that features swim lanes during general swimming time when it's quiet. The pool is not particularly crowded, said Borgeson, which is a luxury for the city. On the weekend there are several food trucks serving South American delicacies parked outside the recreation center. Good for: Family trips, the snacks you can buy after your swimming session. Sunset Park Pool is a great spot for families as its Olympic size allows for athletic swims but also playtime. As a bonus, on clear days the park offers a great view of the city’s harbor, Manhattan skyline and the Statue of Liberty. The pool re-opened in 2012 after undergoing a massive overhaul. The facility is known for drawing large crowds — and maybe also for its rough start. This 37,950-square-foot pool can hold up to 1,500 swimmers and also features plenty of deck space. Also called the Floating Pool Lady, the seven-lane pool sits on a movable barge and is accessible via a gangplank. It offers a beautiful waterfront view. The barge features a locker-room, bathrooms and showers. The pool might not be the best for your athletic training as there are a lot of kids but it’s a great outdoor destination to have fun, according to Borgeson. Children must be 4-foot-8 to enter without an adult. Good for: A fun trip on a hot day and the waterfront view. At 330 feet long and 120 feet wide, Crotona pool is the largest pool in the Bronx and the fourth largest in the city, according to the Parks Department. The pool can get busy with an average of 5,000 people using it weekly during the summer. But during the morning and night lap sessions, the large pool is pretty quiet according to Borgeson. The space also features outdoor spray showers. Astoria Park's pool is the city's oldest and largest, at 330-feet long and able to hold 3,000 people. The pool facility, which also features a children's spray area, first opened in 1936 and offers a beautiful view of the Triborough Bridge. The main pool was built to Olympic standards, according to the Parks Department. There also used to be a diving pool, which the city plans to turn into a performance space. The landmark Olympic-size swimming pool and its wading pool are just a 15-minute walk from St. George Ferry terminal. Only drawback: the lockers tend to be small, according to online reviews. Good for: A dive in a landmark pool.